The Bradley Counter height Stool is one stool in a collection of many minimalist, urban styles designed by Amisco. Amisco aims to offer affordable seating options for people of all age groups and style inclinations. 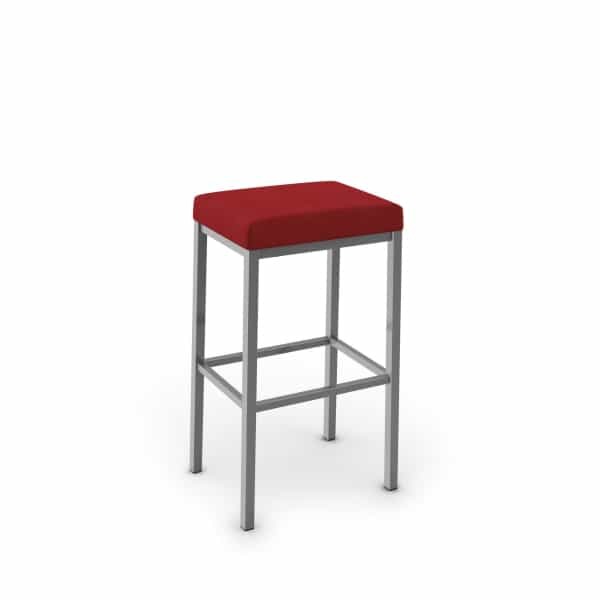 A hip minimalist should consider the Bradley Counter Height Stool for countertop dining. The Bradley is backless, making it a space-saving option. It slides easily beneath countertops to make way for foot traffic or other furniture. This design is ideal for small apartments or studios. The boxy design hints at a minimalist, edgy design but it could be integrated into other styles, too. The cushion and footrest combination offer comfort for long-term seating during meals or nights spent sharing conversation at the countertop. The frame is made of metal, but the finish style is up to you to decide. The cushion cover is also customizable. View the options. Perhaps there is a perfect combination that will make your dining space pop! Finish You choose. Please view options below! Cushion Color You choose. Please view options below! This item ships via UPS / FedEx. Most delivery times within the Continental U.S range from 2-3 weeks days depending on production time and location. All Amisco bar stools are made to order in your desired finish and fabric and are considered "Special Order", therefore cannot be returned once order has been fulfilled.